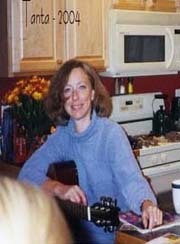 Personal income increased $3.8 billion, or less than 0.1 percent, and disposable personal income (DPI) decreased $4.6 billion, or less than 0.1 percent, in July, according to the Bureau of Economic Analysis. Personal consumption expenditures (PCE) increased $25.0 billion, or 0.2 percent. Real PCE -- PCE adjusted to remove price changes -- increased 0.2 percent in July, compared with an increase of 0.1 percent in June. Personal saving -- DPI less personal outlays – was $458.5 billion in July, compared with $486.8 billion in June. 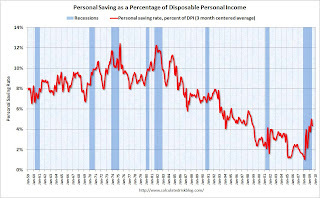 Personal saving as a percentage of disposable personal income was 4.2 percent in July, compared with 4.5 percent in June. This graph shows the saving rate starting in 1959 (using a three month centered average for smoothing) through the July Personal Income report. The saving rate was 4.2% in July. Households are saving substantially more than during the last few years (when the saving rate was around 1.0%). The saving rate will probably continue to rise. 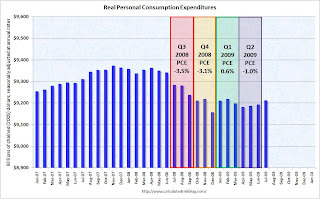 The following graph shows real Personal Consumption Expenditures (PCE) through July (2005 dollars). Note that the y-axis doesn't start at zero to better show the change. The July numbers suggest PCE will grow at a 1.3% (annualized rate) in Q3. Note that PCE declined sharply in Q3 and Q4 2008 - the cliff diving - and was been relatively flat in Q1 and Q2 2009. Auto sales should gave a boost to PCE in Q3, but in general PCE will probably remain weak over the 2nd half of 2009 and into 2010 as households continue to repair their balance sheets.